It’s amazing how much we are finding out about other bodies in the solar system these days. And the images we get back from some of our robotic spaceships can be incredible. Here’s one taken by Cassini during a deep swoop past Enceladus, a moon of Saturn. This is an intriguing moon because it is thought to contain an ocean of water below an ice surface. It is also very active with plumes of material shooting at least 1000 km into space. 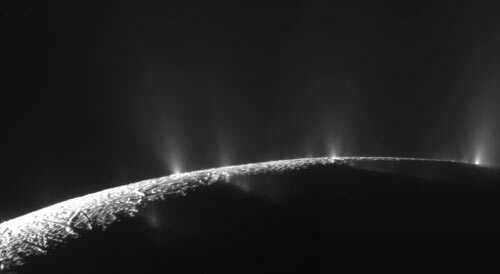 In fact, these plumes may be contributing material to Saturn’s rings. The swoop, early this month, was the deepest yet brought the spacecraft to about 100 km from the moon’s surface. it also took the craft through the heart of a plume enabling further investigation of its compositions and density. Scientists thinks the heating and tectonic activity arises from tidal forces caused by proximity to Saturn. There is even speculation that this energy and the presence of liquid water could provide conditions for life on the moon. Thanks to Emily Lakdawalla at The Planetary Society Blog. Click on Enceladus flyby for a compostie animation of images of the plumes. Greetings to All You Fellow Cassini Travelers! This entry was posted in Science and tagged Cassini, Enceladus, images, NASA, Rings of Saturn, Saturn, solar system, space, Spacecraft. Bookmark the permalink.